Home | Breast Reduction- for Males?! Breast reduction is a common procedure for women suffering from discomfort or back pain caused by overly large breasts. For those patients, the procedure can create a more proportionate figure and make everyday life much more comfortable. We offer a similar breast reduction procedure for male patients to remove excess fat and tissue from the pectoral area. This is commonly found in males dealing with a condition called gynecomastia. The term gynecomastia actually refers to the abnormal increase in the size of male breast tissue. As a man dissatisfied with the presence of male breasts, you may be feeling out of place in your body or overly self-conscious. It can be an embarrassing and awkward experience for many men, and can be brought about by factors as diverse as age, weight fluctuations, genetics, and the use of certain medications. For those that may be affected by this condition, we want to help inform you about the treatments and solutions available to help remedy the situation.The procedure can be tailored to fit your unique body type and achieve your aesthetic goals. Typically, we’ll make a small incision and use liposuction to easily remove excess tissue or fat. 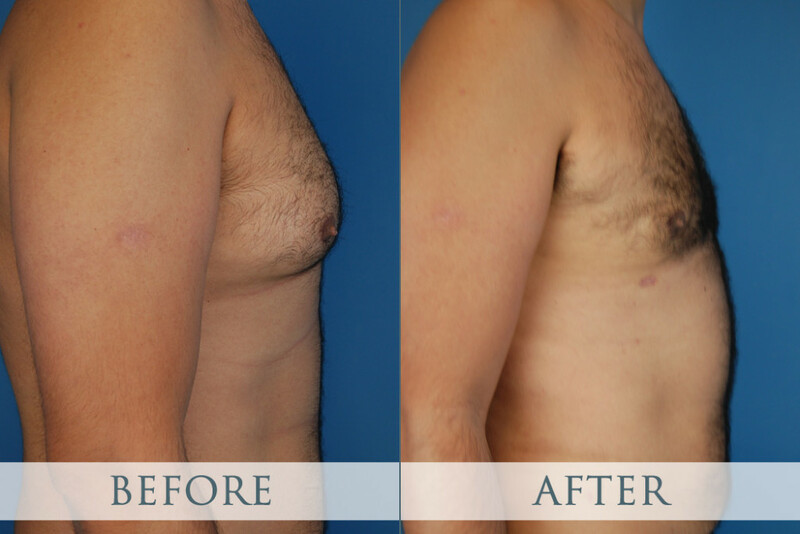 If the gynecomastia has been caused by excess glandular tissue, a larger incision will be required, through which we can remove excess fat, tissue, and skin. Both methods can ultimately result in the disappearance of any awkward or excess breast volume to leave you looking trim and feeling your best. Recovery from the procedure is relatively quick. Pain and swelling decrease within the first few weeks, with the help of compression garments and pain medications. We should have you back to work within a couple of days, and you can also resume mild exercise in a few weeks. It’s recommended to avoid strenuous and demanding work for the first month or so. After a full recovery, sustaining a healthy diet and strong exercise regimen are both important for maintaining incredible results.